What kind of tax records exist? 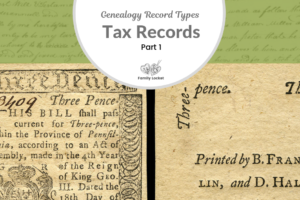 That’s what I want to share today in the second post in our back to basics with tax records series. 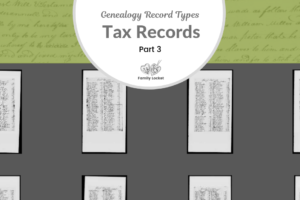 The first post, by Diana, gave you a taste of what tax records may contain and how you can use them in your research to determine identity and relationships. Hopefully now you’re convinced of their usefulness. Tax records might be especially helpful when you’re facing a tough problem like a burned county or when you are performing reasonably exhaustive research. Let’s discuss what types of tax records exist. Part 3 (coming out next week) will be about how to find tax records. While the example discussed below is a tax list combining both poll taxes and property taxes, it is a great example of how poll taxes can be a substitute for census records, because they include all the men within a certain age range, not just landowners. I used tax records extensively in a recent client project to identify John Johnson, the father of Harris Johnson, among several John Johnsons in Rowan County, North Carolina. I learned much about the value of tax records and how they can be used as evidence. Within Rowan County, there were about 10-15 tax lists, each for a different neighborhood called a “company.” Each year, I found that sevearl of the companies had a man named John Johnson. I wanted to know which one was John Johnson of Cabin Creek. I traced each John Johnson by grouping him with his neighbors. I identified the men by the neighbors listed in the same tax company, usually about 40-80 men. Randal was taxed for 1 white poll and John was taxed for 100 acres of land and 1 white poll. Tax records can give clues about the age of a person being taxed. Originally, North Carolina laws regulating taxable polls (or heads) stipulated that males age 16 and older were taxable. In 1784, the law was changed so that only males over 21 were taxable. In 1801, the law was changed again to exempt men over age 50. In 1817, the age of 50 was lowered to 45. From this 1802 tax list, then, I can deduce that John and Randal were between the ages of 21 and 50. The tax records for the period of 1800-1807 were invaluable for separating John Johnson of Cabin Creek from the other John Johnsons. This is a tax record created by Cass County, Texas in 1855. This is a good example of real property (land) tax, personal property tax, and poll taxes all being combined into one record. In the image above, you can see the left portion of the page, including columns for Real Property – Land and Town Lots. In the image below, you can see the right side of the page, including columns for Personal Property – Negroes, Horses, Cattle, Money at Interest, merchandise on hand 1st January, miscellaneous property. The value of all this property was then added up. The poll tax was in the next column. Then the total tax was calculated to pay to the state and to the county. The tax records from 1853-1858 in Cass County, Texas, are direct evidence of Moses Isenhour’s residence. When I was performing this research, learning about Moses’ residence in Cass County cast doubt onto my hypothesis that he served in an Arkansas regiment in the Civil War. But when I completed the research, I learned that Moses migrated from Montgomery County, Arkansas, to Cass, Texas, then returned to Montgomery. Moses’ wife Amanda remained in Cass. In fact, she appears on the Cass County tax list in his place from 1859-1869. Amanda Isenhour and their children are enumerated on the 1860 Federal Census in Cass County. Moses is not enumerated anywhere on the 1860 census, at least that I could locate. Learning about Moses Isenhour’s migration from Akransas to Texas and then back to Arkansas was very important in identifying his Civil War service. Typically, a man’s residence in 1860 is a big clue to which regiment they joined. I found two Civil War service records for men named Moses Isenhour. One in Bosque County, Texas, and one in Montgomery, Arkansas. The man who lived in Bosque County, Texas, was married to a different woman and was buried in Missouri. 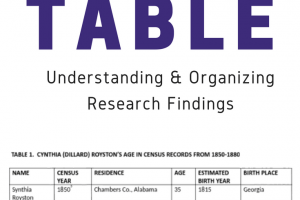 As you can see, tax records can be extremely helpful identifying the residence of a person in between census years, or when they are completely missing from one of the federal census years. Join me next week to learn all about how to find tax records! Rowan County, North Carolina, 1802 Tax Book, Capt Ellis Co. List, unpaginated, lines 24-25, entry for John Johnson and Randel Johnson; “Tax records (Rowan County, North Carolina), 1758-1892,” image online, DGS 8151623, image 45; FamilySearch (https://www.familysearch.org : accessed 17 November 2018); citing FHL microfilm #1760528. State Library of North Carolina, “Tax Records in North Carolina: NC Tax Records,” (http://statelibrary.ncdcr.libguides.com : accessed 13 November 2018). “War of 1812 Pension and Bounty Land Warrant Application Files,” database and images, Fold3 (https://www.fold3.com/image/1/314586309 : accessed 19 November 2018); image of declaration of surviving soldier for pension for pension 25568, service of Abraham Johnson (Private, Capt. Jacob Krider’s Co. N.C. Mil); citing “War of 1812 Pension and Bounty land Warrant Application Files, compiled ca. 1871–1900, documenting the period 1812–ca.1900,” National Archives Catalog ID: 564415, Record Group 15, Roll RG15-1812PB-Bx1874, National Archives, Washington, D.C.
 Moses Isenhower, 1855, Cass County, “Texas, County Tax Rolls, 1837-1910,” database with images, FamilySearch (https://familysearch.org : accessed 11 Nov 2017), image 16; citing State Archives, Austin. Clarence Ray Wharton, “William Martin Isenhower, Texas Under Many Flags: Texas biography (Chicago: American Historical Society, 1930), vol 3, 167-168; image copy, FamilySearch (https://familysearch.org : accessed 24 March 2018), digital image 660 of 1350; citing FHL microfilm 1000594.